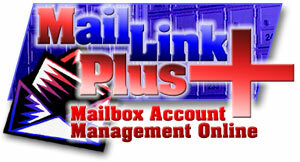 Manage your mailbox online with MaillinkPlus Online Account Manager. With MaillinkPlus, you can see exactly what's in your mailbox. Everyday, we will sort through your mail, record details about each piece of mail into our database and email notification of new mail in the box. WE NOW OFFER SCANNING OF MAIL FOR YOUR TIME SENSITIVE NEEDS. We charge $2 per time for mail forwarding, no matter how many items, plus actual USPS postage. Some of our competitors have hidden fees in the postage they charge you, or charge you for forwarding whether you have mail or not, or charge you to check your mail. We always charge actual postage + $2.00 and if you don't have mail or wish to skip a forwarding, or want us to toss the junk mail we won't charge you. We also offer the Priority Mail Flat Rate Envelope for forwarding, this envelope can hold up to 35 first class letters and costs only $4.90 + $2.00 handling. We also ship via UPS, or Fed Ex on our account or your account. For rates to your location call for a quote. Mail Forwarding wherever you are. or when you request it. Keep It ! , Ship It ! or Trash It ! With each item, you can determine how to process it. Leave Inbox - Not a huge priority to see the item. Just leave it in the mailbox. Throw Away - Not interested in junk mail? Not a problem. Click on Throw Away and we will toss that item in the trash. This will save you money by not having unnecessary mail shipped to you. Next Shipment - Click on this choice when you are getting ready to request a bulk mail shipment to your address. When you click on "Request New Shipment", all items in the list with "Next Shipment" selected will be shipped. All items you want sent will be listed, along with the total weight of the items you will receive. All you have to do is confirm the address you want your shipment sent to. If you are not at your preset shipping location, you can change it to the location you may be visiting, without affecting your default information. We will ship your mail to you the following day. An e-mail will be sent to you, containing the shipping information (shipping company, tracking number, and expected arrival date), as well as your current account balance. At any time, you can view your past shipments. The list will show you the date the shipment was sent, as well as details about each item in the shipment. At any time, you can make changes to your default shipping address, e-mail address and more. You can even set regular intervals for automatic shipping of your mailbox contents, as well as request automatic "trashing" of your junk mail. You may also add money to your account online or pay the rental with your credit card online. Do it all with MaillinkPlus Online Account Manager - Mail Forwarding Made Easy.